And how is this story related to Design Thinking? I am sure by now you wonder why I am telling this story and how it is related to design thinking. It`s simple, imaging my son would have packed his backpack by himself with the knowledge he had due to the tent experience and the physical law I taught him. He might have ended up on top of the mountain as an icicle in his bathers! I am afraid to say, that according to the book of Idris Mootee “Design Thinking for strategic innovation” (2013) that’s exactly where (big) companies are heading to because of their leading managers. Idris Mootee does not say that they will be hiking in the mountain but she points out that they will get stuck and frozen and will not be able to keep up with this fast changing world, which is throwing many wicked problems into their face. “Given the speed of change today, extrapolating from the past could lead companies down a dangerous path,” says Idris Mootee (2013; 54) – because “new challenges have no history” she adds. In her book, Idris Mootee states that future managers should focus on value creation more then on value capture. She explains that until now management education theories and tools focus on value-capturing efforts and reveals in an impressive way why design thinking is exactly what future managers should learn so they can lead companies into the future in a new and creative manner so they can face the wicked problems coming. The author Mirjam Pfenninger is a SID student & Research Associate at Zurich University of Applied Sciences – Institute of Facility Mangement. She is strongly convinced that Design Thinking should be applied to teaching at ZHAW and all over the world. 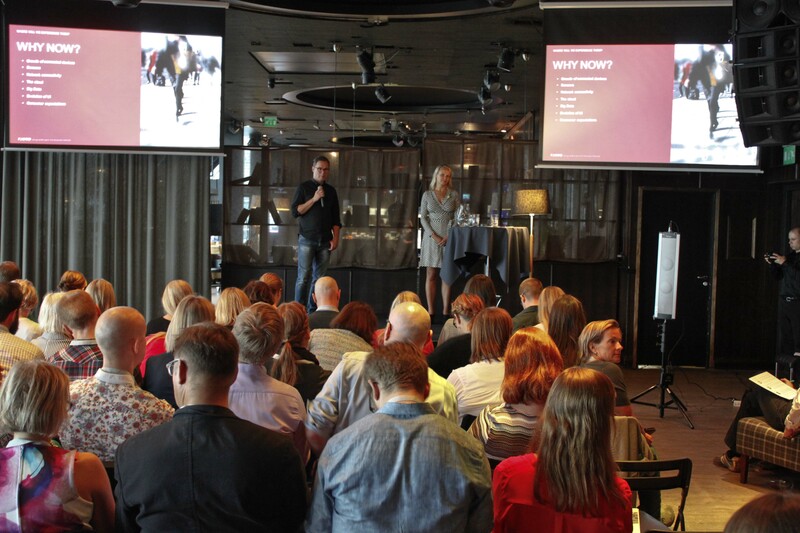 Thursday 19th of May I participated OP Bank´s service design 90 minutes seminar at Radisson Blu Hotel in Kamppi. Harri Nieminen introduced us the world of OP and their new strategy behind OP´s customer service. OP has almost 180 banks all over the Finland. They also offer services for their customers from insurance and health care section. One of the most important competitive actors in customer service 2016 is customer experience. For this reason you must know your customers very well. Today´s challenge is not only customer´s service experiences but also technology. Digital world offers and creates new competition worldwide. People are asking service in different ways than before. To get there what people are waiting for, OP works together with several designers and listens carefully their own customers. Empathy is cornerstone. At OP their want to create services that are meaningful and loveable, they want to solve existing problems together with their customers. For this as a method OP use OP Design Sprint. Design Sprint is 3 days hands on working together with customers: day1 is learning, day 2 is creating, and day 3 is testing. Harri Nieminen says: ”If we don’t understand and validate needs of our customers, we concentrate easily for wrong details” “Designer is a trustee of client”. For me message of this seminar was clear and loud – OP Service design is making things visible and understandable, doing in practise in OP world. At the same day I participated for DesignersDay 2016 at Apollo Club, Helsinki, organized by Kesko. Idea behind this day was networking with different type of designers. This evening I was privileged to listen lectures from Dutch designer Gunther Bauer and Finnish Service Design expert Juha Tuulaniemi. Mr Bauer talked about his own company “Pimp my shop”. His motto “Learn by doing” has brought him in to retail designing. Through Amsterdam based company Finishing Dutch retail design he has worked together for example big cosmetic and beauty shop Etos in NL. In his example during the lecture I found it fascinating how he added music in his slides while telling us about his project; music to attract our senses! Just like you should do when designing services to people; To get their attention you have to catch the people. Mr Bauer used music to catch up our attention! “You must attract! You have to communicate! You have to be there! Customer wants value and you must answer their needs!” – this was bottom line from Gunther Bauer underlined with Ikea commercial. It is Saturday morning and everyone in our group seems to be in need of strong coffee. Last night we ended up asking “why”, today we will give an answer; who do we want our customer to become. In today´s agenda we have one more interview and by the end of the day we will give a presentation, we will pitch the business plan of our team. After interviewing the student our picture of our customer segmentation became very clear! We are focusing for parents, 40+, digital native people who can afford to spend some extra money for daily luxuries such as for cleaner or nanny, or who are in charge of their own aging parents for example. Our group´s working stations for plan presentation divided naturally; visual person search pictures for power point, technical person played with power point itself, business person did the calculations of research and person who was called human, was the all over leader of our presentation and team work. After working few hours we started pitching. Was amazing to hear fellow Hackathor´s presentations. So many interesting service models with great future thinking. Wasn’t easy to select the most interesting one to be best. Actual pitching last 10 minutes and we were proud of our own work. Did audience love it, this we will see on 21st of April, when Kiinteistömaailma announces their chosen project. On 21st of January Futurice and Kiinteistömaailma organized Service Design Hackathon in Helsinki. I get to participate first time in my life for such a happening. It is all very exciting, as I never heard of “Hackathon” before! Young creative and business minded people have arrived to Annakatu 32, to building called “Kamppi´s top end”. On the very last ( 8th) floor situates Futurice´s colourful office, full of creative atmosphere. It has been one of the coldest winter day in Helsinki,almost -20 degrees, so first of all I must get rid of my winter clothes before I enter for this new challenge. Few young programmer-looking guys are preparing some cappuccinos in the kitchen area, people are chatting with each other; everyone seems to be ready to hit the Hackathon! Programme started with CEO of Kiinteistömaailma, Erkki Heikkinen´s speech. He told us about Kiinteistömaailma´s strategy and history. We got to talk about today´s megatrends of housing and goals, which Kiinteistömaailma wants to reach. Hackathon is here to help them to innovate and create new services with service design methods. It is here to create something inventive and urban. Maybe it ends up even for “Tinder of Living”, who knows! We all know that way of housing and living is going through some major turning points these days. Aging, immigration, urbanization and community housing are not only trends of 21st century but also facts we need to take in to consideration. Risto Sarvas, Creative Director from Futurice introduce us to so-called Service Creation checklist. What should you check before you start building up a service? First of all, “you can´t plan the future, you need to build it!” was Risto´s starting point. “And as you can´t know what you build, you need to experiment, fail & learn”. “Always find a problem worth of solving as value is in the iteration” adds Risto. “Love the problem, not solution as solutions you can always change!”. Was fascinating to realize that this is exactly what I have been studying the whole last semester in Laurea. So this is it- Service Design in real life! Hackathon is working together. We audience were sorted in to groups by choosing different colour post-it. I choose orange: colour for visual mood. As an artist background it seems to be easiest choice for me always. Each group should have at least one post-it colour mood: business, technology, visual and human. 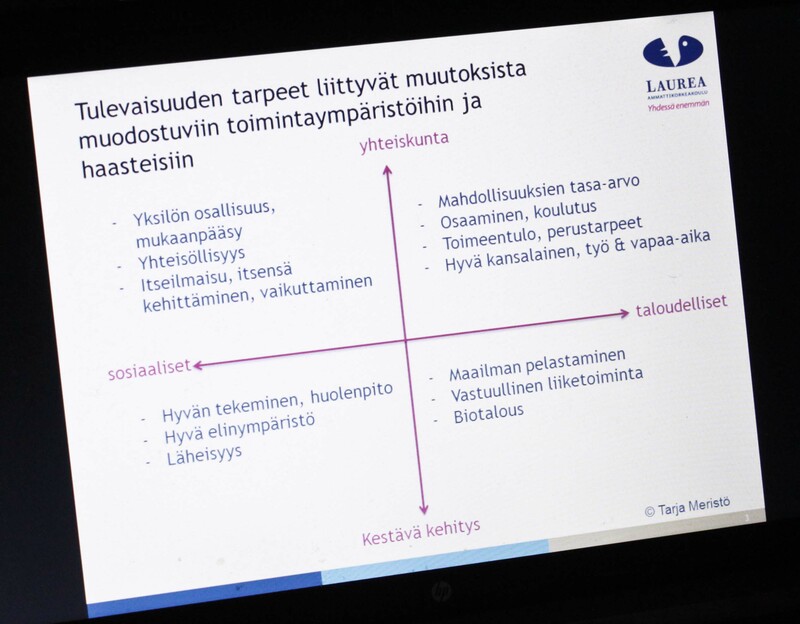 Once we were into groups we had to choose a topic of Kiinteistömaailma´s one strategy options. 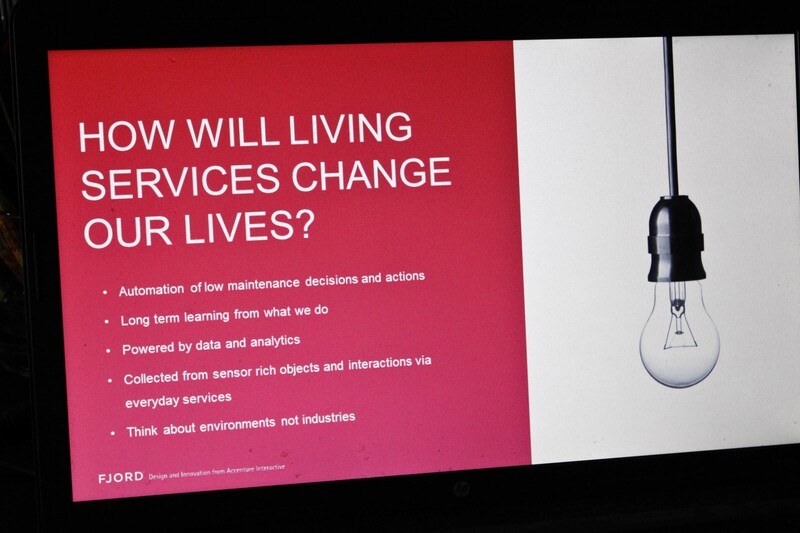 Our group choose “Service of living in the future – 2020?”. We talked about lot of today’s technology contra people´s wishes of presence. Technology is taking place of daily life. It has it´s good sides but also bad ones. So we started to look our topic from “how people will like to live in the future” point of view. We figured out several good ideas, which I of course won’t tell you yet 🙂 ! Hackthon has started in our group; we hanged our idea boards on the wall – grabbed post-its and pens. Creative ideas started to fly around our table. HOW TO GET EVERYONE IN THE ORGANISATION WORK TOWARDS CUSTOMER CENTRICITY? Service Design Network Finland held the second Business Meet-Up event which was hosted by Nordea, one of the largest banks in Northern Europe with 10 million customers (of which 4.6 million are also e-customers), 1,100 branch offices and 29,000 employees, in its permises on Keskuskatu, Helsinki. Representives from different companies, agencies, state administration offices took part in the event in order to share and gain knowledge on internal service design activities. The first speaker, Pontus Slotte, Head of Management Support at Nordea Private Banking, introducedd the service design that helped Nordea improve their customer experience. He shared with us the new higher figures: on a scale to 10, the customers´ average experience currently stands at 9,19. The next presentation was held by CEO Timo Kaisla of the real estate agency SKV. The other key players in the industry call SKV “the Center Party” (keskustapuolue) of real estate because it is active mostly outside Ring road 3 (Kehä 3). SKV controls more than 30 % of the market outside Helsinki in places like Joensuu, Kuopio, Jyväskylä etc. Previously, Mr. Kaisla used to work in a service design agency. When he was asked to join SKV, he insisted on being able to use service design methodology in order to improve the company. And he succeeded with the help of SD tools developed by a small Helsinki-based boutique company . This month (November), SKV has introduced three brand new services to the Finnish market. One of them is the “Story of your home” (Kodin tarina) – a new way of selling houses with the help of a written description, pictures and video. Mr. Kaisla says: Only after the seller and the buyer close the deal in a bank, the buyer starts asking “Where do you buy milk on Sundays?” or “What is the best school in the area?”SKV´s solution is to utilize that information in the beginning of the house selling process. In Finland, only 10 % of real estate transactions are conducted by the owners themselves. The rest lie in the hands of professional real estate agencies. This is one way how to increase the chances of selling a house. Their motto is: NOTHING SELLS BETTER THAN A GOOD STORY! The last presentation was delivered by First Vice President Taina Mäkijärvi about the successes and pitfalls of managing a development project with SD tools. Nordea hired an SD agency to plan a workshop with their customers regarding the tools to be applied. Everyone who took part loved it and said to go ahead. So they designed a Service design training course and engaged a professor from a German university in the process. After having cooperated with an external SD coach who tought them how to approach customers, they now train their own people within Nordea to interview clients and think outside the box. After that, we were split into three groups and each group concentrated on one subject related to SD. My group was given the following task: How to get everyone work towards customer centricity in the organisation? We came up with a number of ideas and devided them later into 9 themes. Each theme has approximately ten ways how to get everyone to cooperate towards customer centred services. Here you have the results of our group´s brainstorming whirlwind. 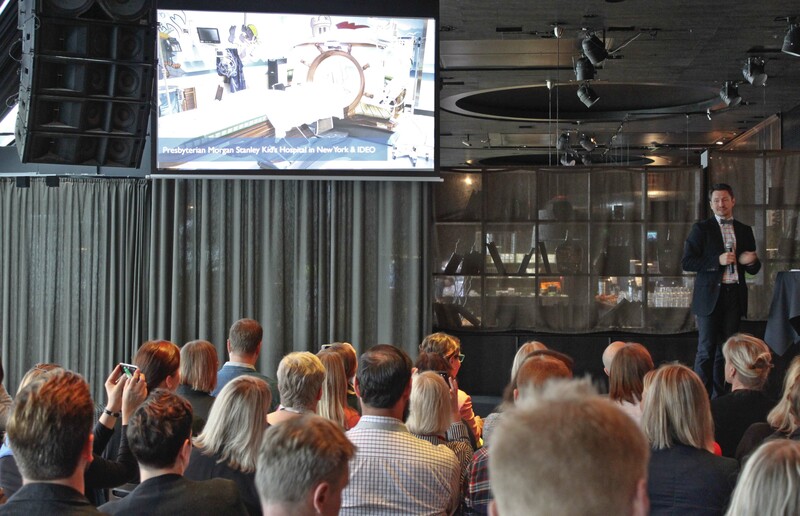 On 3th of September a seminar organized by SDN Helsinki took place at Maxine restaurant. I had a pleasure to be part of the organizing team. The seminar was sold out so we were very pleased. The day started with interesting topics and keynote speakers. Mikko-Pekka Hanski, co-founder at Idean, pointed out how companies are changing from service providers to customer experience makers with customers. Tarja Meristö, futurologist and principal lecturer, told how the customer needs are changing in the future and how services are used then. Teemu Äijälä, Service Design Director from Fjord, presented many interesting examples of living services e.g. Amazon Echo and Dash Button. Äijälä spoke about the fact that customers’ expectations do not compare with similar services. Expectations go across the industries. Customers compare e.g. a visit to doctor to a shopping experience through Amazon. Kamil Michlewski, Brand stategy consultant, academic and author, told how design attitude is rising and why Silicon Valley, IBM or MCKinsey are suddenly all into design. Big companies are hiring more service designers and investments made to service design have grown remarkably.